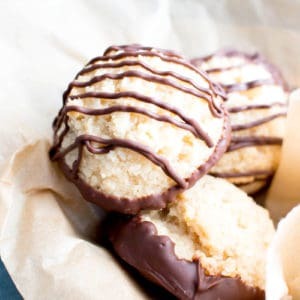 Chocolate Dipped Vegan Coconut Macaroons Recipe (V, GF): an easy recipe for chewy and satisfying chocolate-dipped coconut macaroons made with whole ingredients! Vegan, Paleo, Gluten-Free, Dairy-Free. 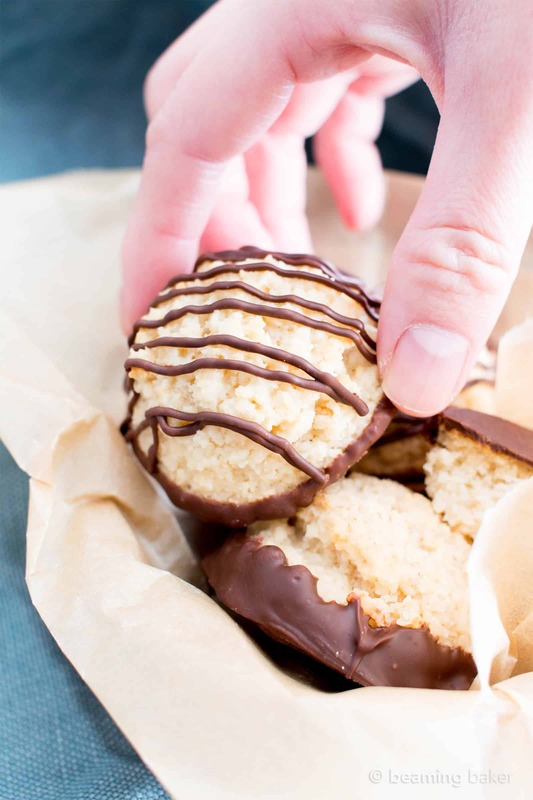 First things first, have you tried my 4 Ingredient Paleo Coconut Macaroons Recipe yet? They are, as my sister Penny would say, the bomb dot com. Okay, do people still say that? Be honest. You let me know and I’ll pass the update onto Penny. 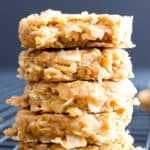 Just make sure you use small coconut flakes to make these babies! Funnily enough, using large coconut flakes leads to utter mayhem (i.e. flat-like-a-pancake cookies). Ah, the line we have to toe between utter bake perfection and sheer baking disaster mayhem. That’s baking for ya! ???? Meanwhile, I am beyond proud of that recipe (when made with small coconut flakes heh heh). And you know I could not, would not resist the urge to dip those in chocolate! 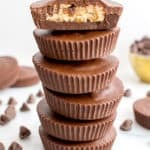 But since not everyone loves chocolate like we do, I figured I’d leave those steps to this post. 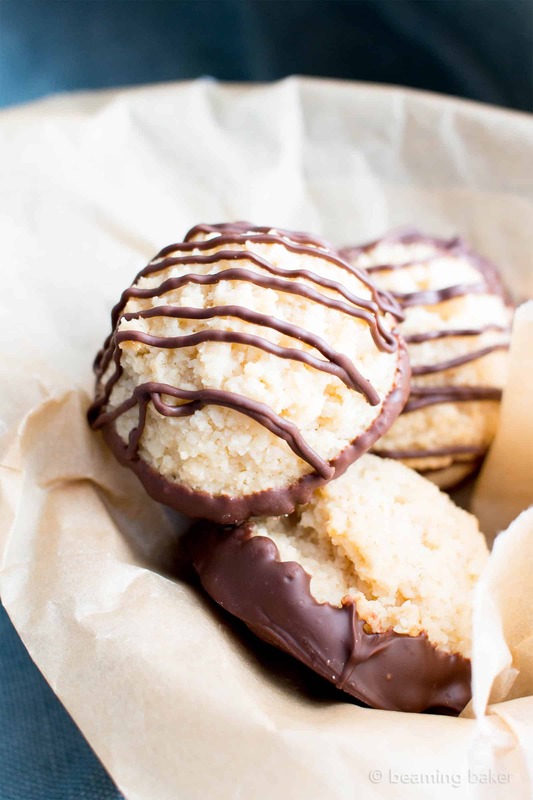 May I present to you: my Chocolate Dipped Vegan Coconut Macaroons Recipe. Yippee!!! Do you hear the same celebratory horns I do? 🙂 The reason why I’m so proud of that recipe is because I felt so lost when I started to test it. 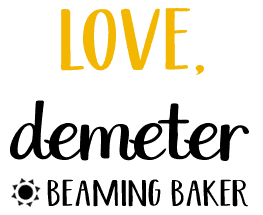 In case I haven’t said it yet, my ultimate goal with Beaming Baker is to share healthy allergy-friendly recipes that actually taste like the classics we grew up with. Here are a few examples: pumpkin bread, vegan chocolate cupcakes, gluten free vegan brownies, vegan chocolate chip cookies. So when I start recipe testing, I generally research classic examples of said recipe. 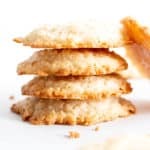 In this case, everywhere I looked, I saw coconut macaroons made with condensed milk, refined sugar, eggs, egg whites, and all kinds of other ingredients we don’t use on the ol’ blogeroo. 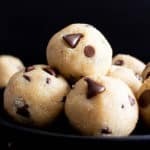 The more classic versions of this recipe I saw, the worse I felt. Could it be done? How do I replace the eggs? The condensed milk? 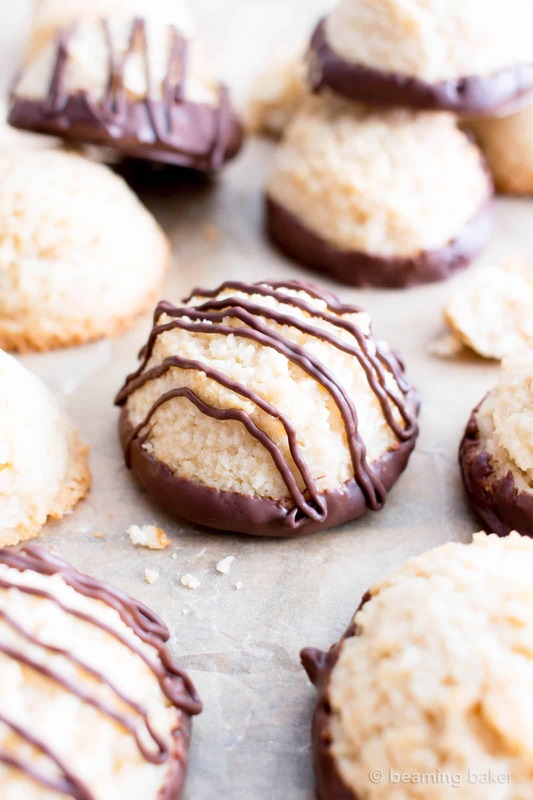 Would I really make you guys open a can of coconut cream to get this chocolate dipped vegan coconut macaroons recipe going? The easier I could make these, the better. And the fewer/healthier ingredients I could use, the better. Not to be confused with fewer healthier ingredients. Teehee. So I threw out the old dessert classics rulebook and approached this recipe like I approached everything else: with my sometimes unusual/slightly rebellious/don’t-really-know-or-care-what-other-people-are-doing/to heck with it self a-tti-TUDE! ???? So I pared it all down to the simplest, most essential ingredients I knew: coconut, coconut oil, maple syrup, and, (drumroll please) almond flour. The almond flour is KEY. It’s the perfect non-flour flour to keep everything together, with not even a whisper of its presence in the final product. The result? 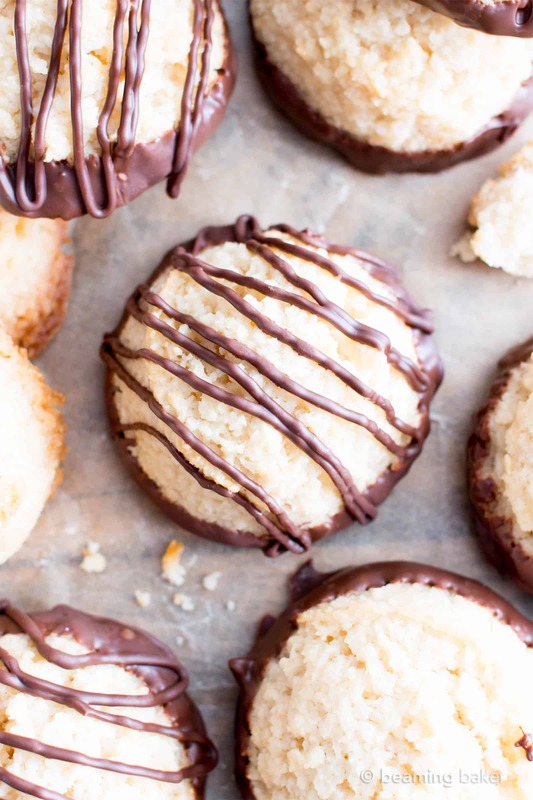 Deliciously dense, slightly soft, and wonderfully chewy coconut macaroons. You can make them as large or as small as you’d like. I had a ball making pretty huge ones! And the coating + drizzle of dark chocolate is just bliss. Perfect dessert bliss. Did I mention? So. Friggin. Good. You grab the coconut and I’ll grab the almond flour! Let’s do this! I’m so grateful to have you here, baking and making all the guilt-free treats with me. 🙂 It’s one of my greatest joys to share in these happy, edible moments with you. Looking forward to hearing what you think. In the meantime, be sure to sign up for my email list so we can keep in touch! ???? Add all ingredients except chocolate (coconut, almond flour, oil and maple syrup) to a food processor. Here are the gluten-free small coconut flakes that I use--you must use small coconut flakes in this recipe, about the size of sprinkles. 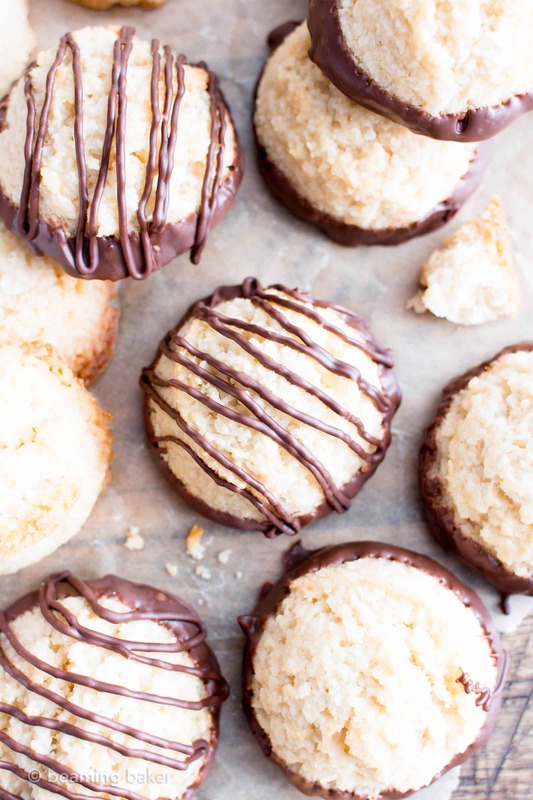 Using large coconut flakes will result in flat, spread-out cookies. Blend until you get a thick and sticky mixture that holds together, with smaller, but still noticeable coconut pieces. If any maple syrup remains at the bottom of the processor, fold into dough until well mixed. Using a 1.5-tablespoon cookie scoop, scoop firmly packed balls of coconut mixture. Drop onto the prepared baking sheet, making sure to space balls evenly apart--they will increase a bit in size. 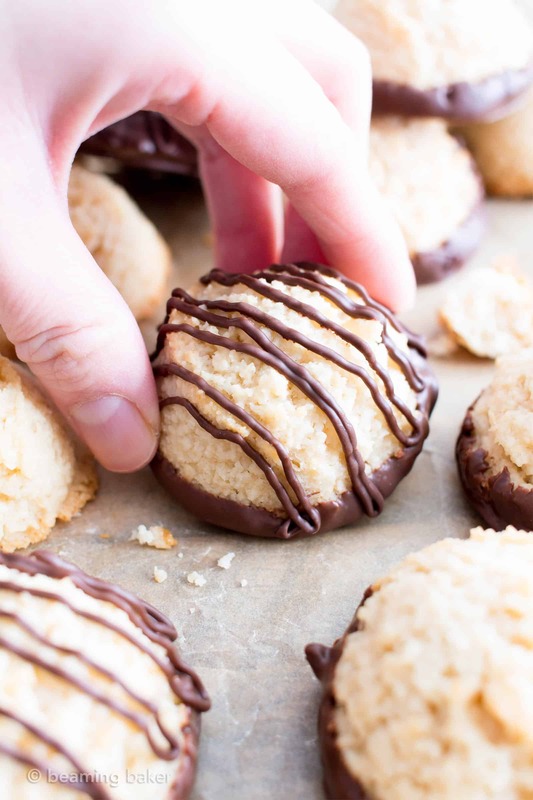 Make the chocolate dip: Cool macaroons completely before dipping. To melt the chocolate, use the double boiler method or do the following. 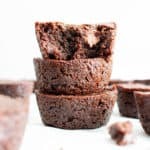 Add ¼ cup + 2 tablespoons chocolate to a small, microwave-safe bowl. Heat in 20-second increments until softened and melted. Stir in between heating increments, until smooth. Dip the bottom of one cookie into the melted chocolate, scraping off excess. Place cookie onto the prepared baking sheet. 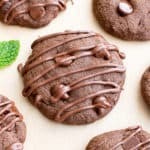 Repeat for all cookies—there will be some leftover chocolate. Melt 2 tablespoons chocolate in leftover chocolate bowl. Spoon chocolate into a small drizzle bottle or a zip bag with a small corner trimmed off. Drizzle macaroons. Chill in the refrigerator for 10-20 mins, until hardened. Enjoy! Storing instructions below. - For smaller, 1-tablespoon cookie scoop sized cookies, bake for 11-13 mins. 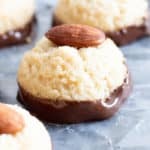 - More Paleo Vegan Coconut recipes: paleo almond joy, chocolate coconut truffles. I’m with you on all but one thing — what kind of a monster wouldn’t want their macaroons dipped in chocolate!? 🙂 Truly, these look amazing. 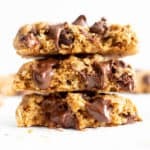 Perfect texture and that chocolate drizzle – I’d eat the whole batch! Hehe. Some people! ???? Thanks so much, Monica. The texture is ah-mazing! I can’t believe they are so easy to make and they look amazing! Shared! Right?? 😉 Thanks so much for sharing! These look delicious, I love the photos too! Wonderful! I hope you and your friends get to enjoy! These look AMAZING! 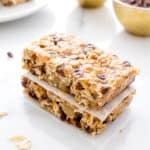 Chocolate & coconut is such a good combo! I have really been trying to eat “real” and clean food. This looks like a great option! Awesome! Here’s a yummy way to start. 🙂 Good luck, Dorothy! Chocolate and coconut are a great combination. My kiddos will love these. These look so gorgeous! I want to dive into my screen! I LOVE the flavor combo!! These macaroons are fantastic!!! Those look absolutely perfect, yummy! Trying to be Nut Free. Would Coconut Flour work if Coconut Oil were increased? Major fail! Followed the instructions exactly including solid coconut oil and they melted all over the cookie sheet. Hi Heather! Hm, did you use small coconut flakes? 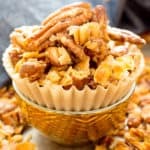 You need to use small flakes in this recipe, otherwise they will spread. Also, make sure you pack the mixture tightly into the scoop. Hope this helps!